This is the last milkshake recipe from our ice cream social. Check out the other milkshake recipes here and here. Most people think of our peppermint mocha cream as a seasonal drink, but I love it in homemade ice cream or a milkshake during the summer. To prepare the glasses, melt chocolate chips or candy melts. Then dip the edge of glass into the chocolate until all sides are covered. Place mint chocolate cream cookies in a zip bag and break into pieces using the bottom of a glass. Press mint chocolate cream cookies pieces into the chocolate. Allow to cool then refrigerate if not using right away. If serving for a party, you can prepare glasses ahead of time. 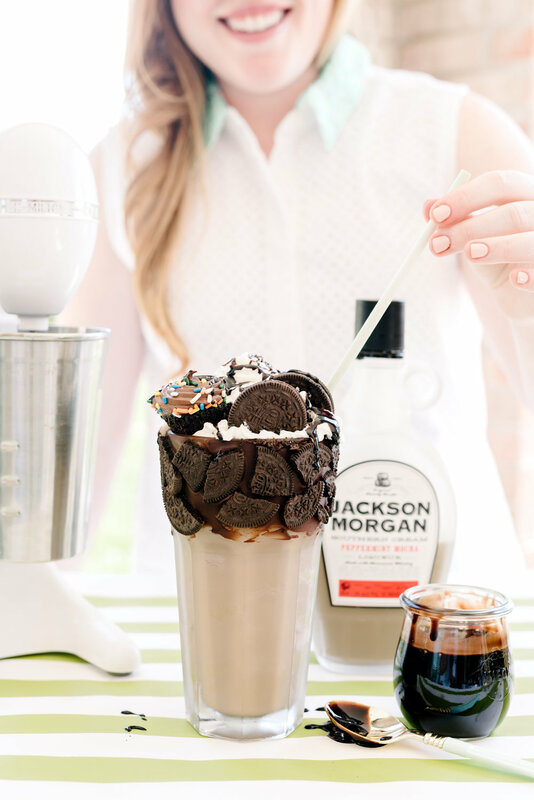 Combine chocolate ice cream and Jackson Morgan in a blender. Blend until milkshake consistency. You may need to add more ice cream for a thicker consistency. Top with whipped cream, mint chocolate cream cookies, sprinkles, mini chocolate cupcakes, and chocolate syrup or your favorite toppings. Serve immediately.